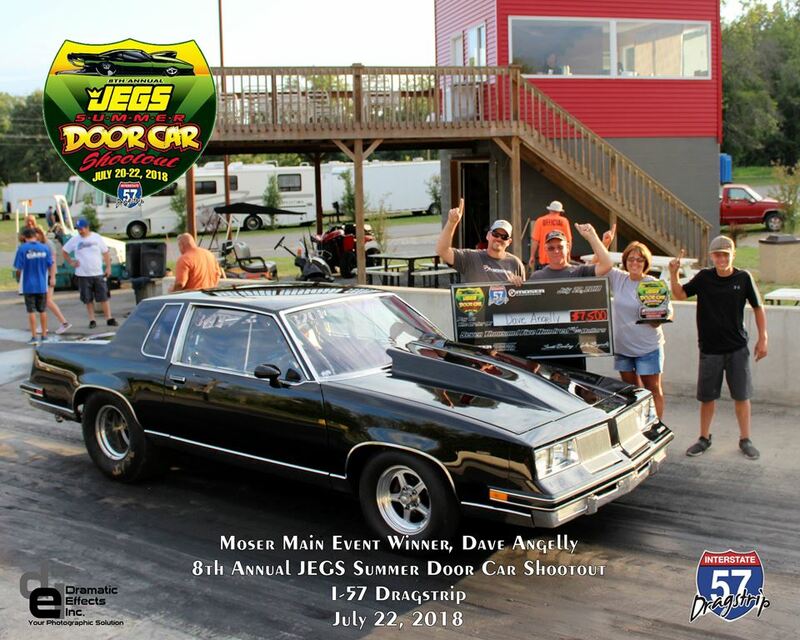 I-57 Dragstrip played host to the “Biggest Little Door Car Race in the Midwest,” the 8th annual JEGS Summer Door Car Shootout last weekend. Nearly 200 of the best door car racers from the region were greeted by sunny skies, great prize money and a growing array of valuable prizes throughout the weekend. On-track action kicked off Friday with the $5,000-to-win Ohio Crankshaft pre-game event. 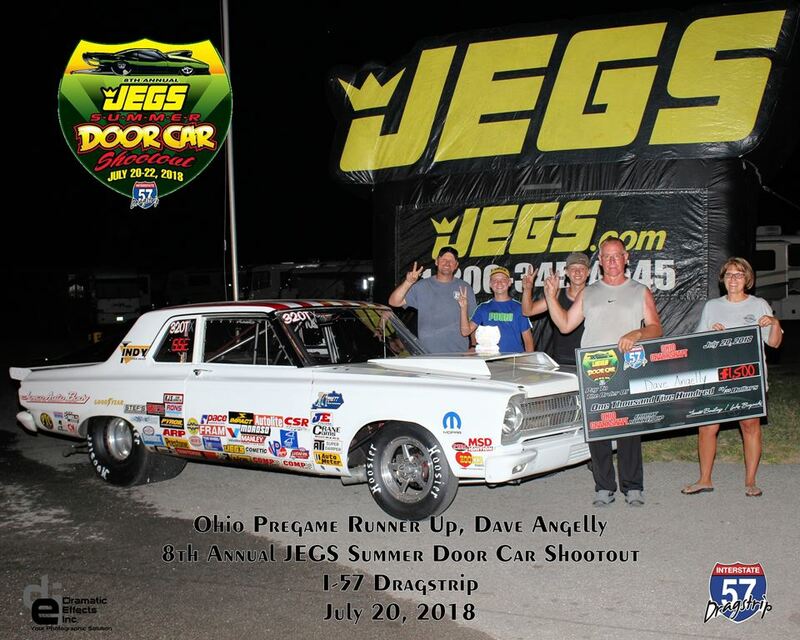 When the smoke cleared, it was a pair of I-57 Dragstrip regulars dueling for the big check: Donnie Ellis (Vergennes, IL) defeated Dave Angelly of Carrier Mills, IL in the final round. 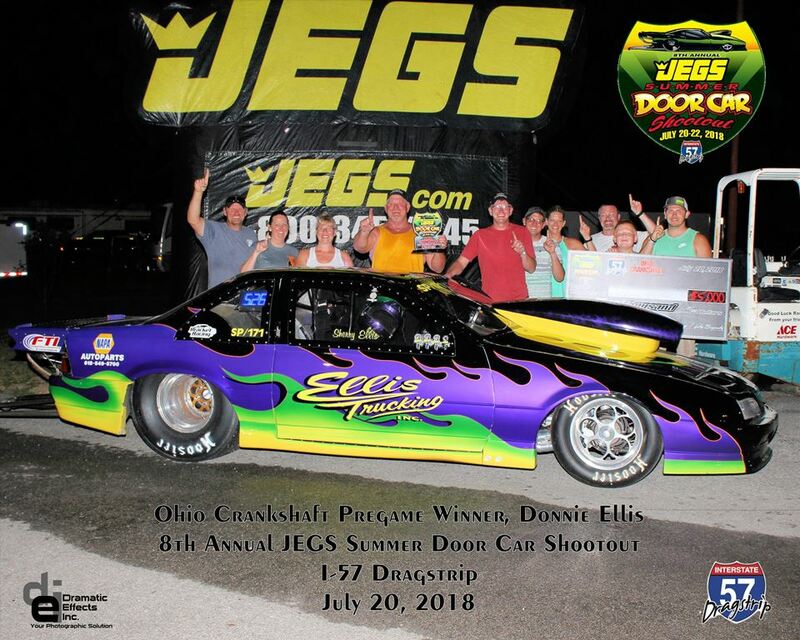 Both Ellis and Angelly have attended every JEGS Summer Door Car Shootout to date, and both have had previous success in the event: Ellis was a runner-up in the Quick 16 back in 2013, and his son Kyle took runner-up honors in the main event the following season. Angelly was a Quick 16 runner-up in 2015, and has been a regular in the late rounds of the event. Also of note Friday night: last season’s Moser Sunday Main Event winner, Tony Atchison advanced to the quarterfinal round before losing to Ellis. 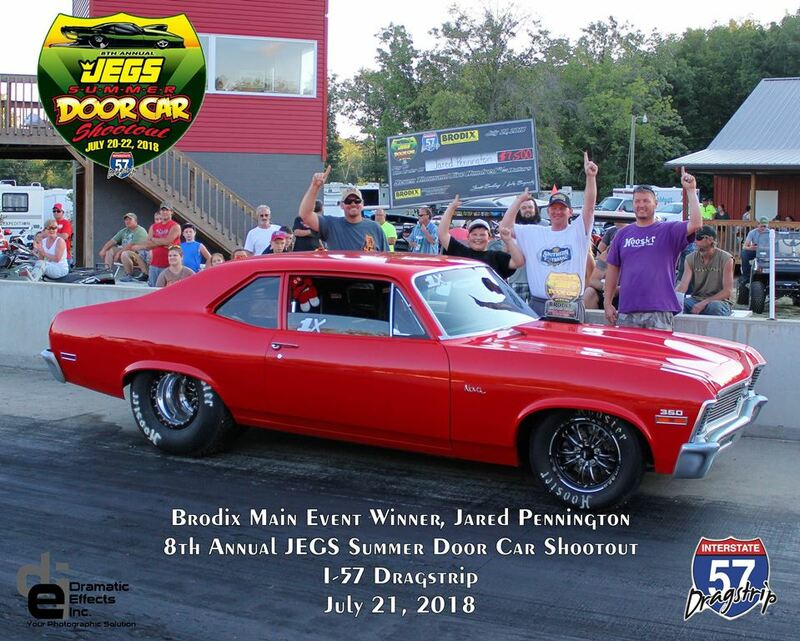 Between the two days of racing, spread over almost a full calendar year, Atchison accumulated an incredible 15 consecutive JEGS Summer Door Car Shootout win lights! Saturday, as Summer Door Car Shootout fans and competitors have become accustomed, brought a full day of non-stop action. Alabama racer Jared Pennington was the first big winner of the day. One year (almost to the day) removed from an encounter with the I-57 Dragstrip retaining wall at last year’s JEGS Summer Door Car Shootout, Pennington drove his familiar “Big Red” Nova to the $7500 BRODIX Main Event title over Jeremy McKague in a final round decided by just .001-of-a-second. In what was one of the more memorable moments of the 2018 event, Pennington, the well-known announcer and co-host of the Sportsman Drag Racing Podcast, was interviewed by his 12-year-old son JJ on the starting line following the final round. 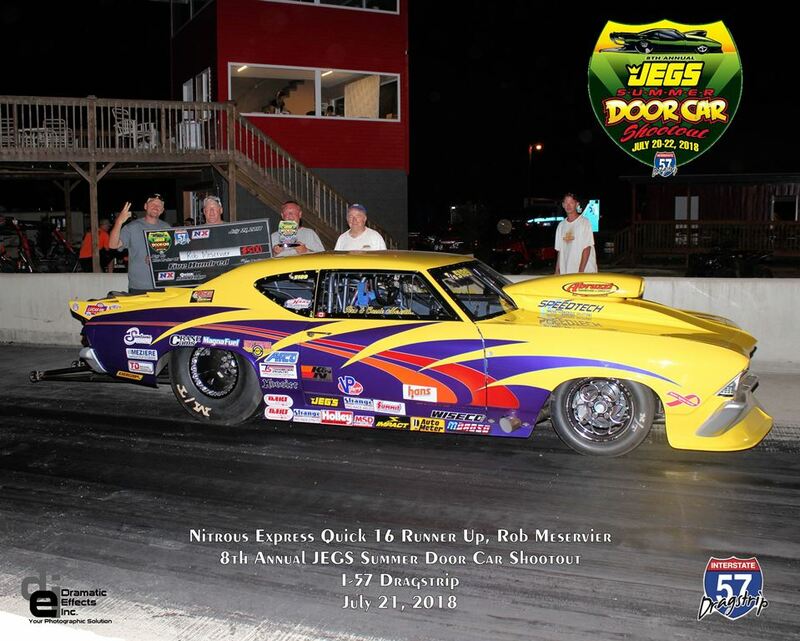 McKague, it should be noted, added to his legacy as the most decorated performer in JEGS Summer Door Car Shootout history: Saturday’s final round appearance was the sixth final round in the 8 year history of the JEGS Summer Door Car Shootout for the Chamois, MO based runner. Pennington’s victory served as an appetizer of sorts for the evening schedule that featured a packed house of spectators to watch the Drag Illustrated Fan Appreciation Night, which included Nitrous Express Quick 16 eliminations, the APD King of Illinois shootout, and the conclusion of the JEGS Wheelie Wagon and Mickey Thompson burnout contests. Indiana racer Josh Luedke drove Josh Harper’s Camaro roadster to the NX Quick 16 title with a win over low qualifier (and RacePak Long Tow Award winner) Rob Meservier. 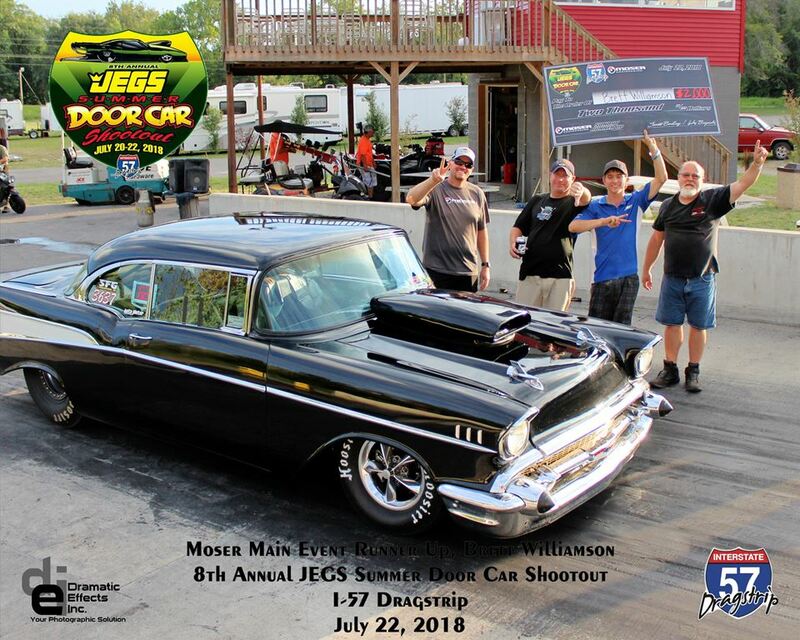 Meservier was making his sixth consecutive JEGS Summer Door Car Shootout, all the way from Thunder Bay, Ontario, Canada! The unique APD King of Illinois event annually features a $500 entry fee with a 100 percent, winner-take-all payback. 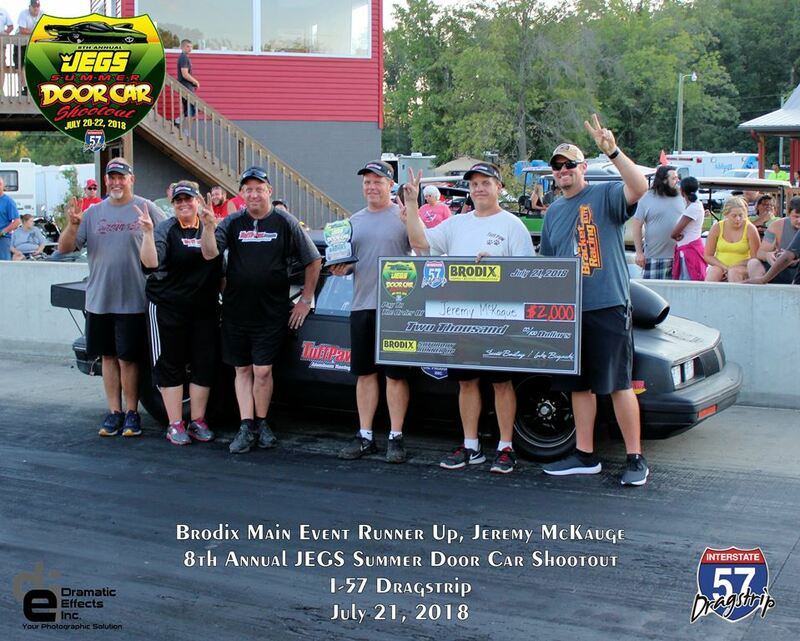 More than 25 percent of the JEGS Summer Door Car Shootout entrants ponied up the cash entry, making for the biggest payday in event and I-57 Dragstrip victory: $26,000 to the winner! 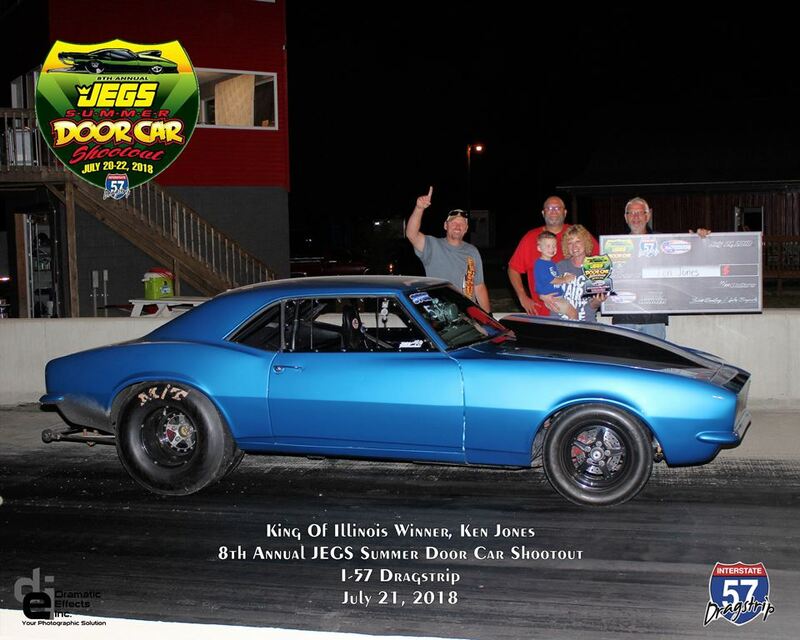 At days end, it was another longtime I-57 Dragstrip regular, Ken Jones taking home the cash. 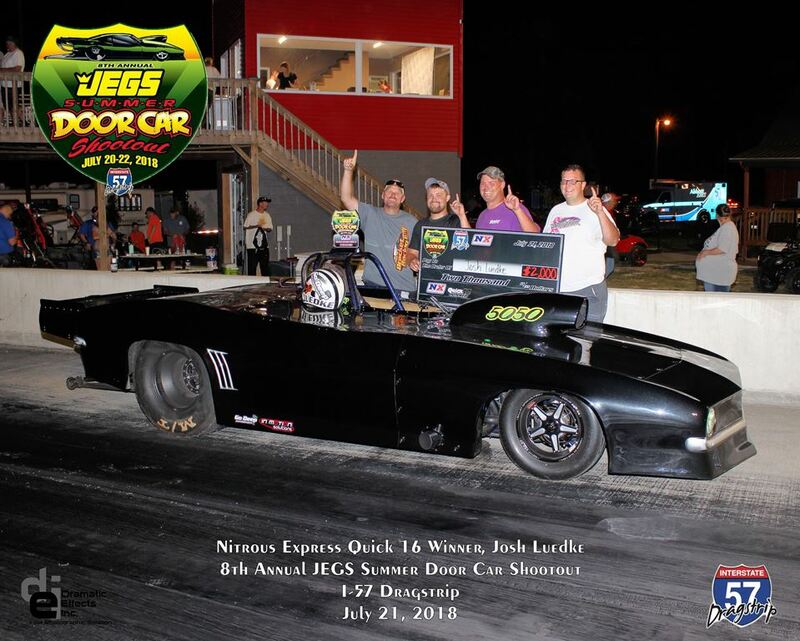 The win capped a huge month of Jones, who scored a $5,000 victory at the same facility on July 3, and also won a $2,500-to-win event at nearby Accelaquarter Raceway in early July. 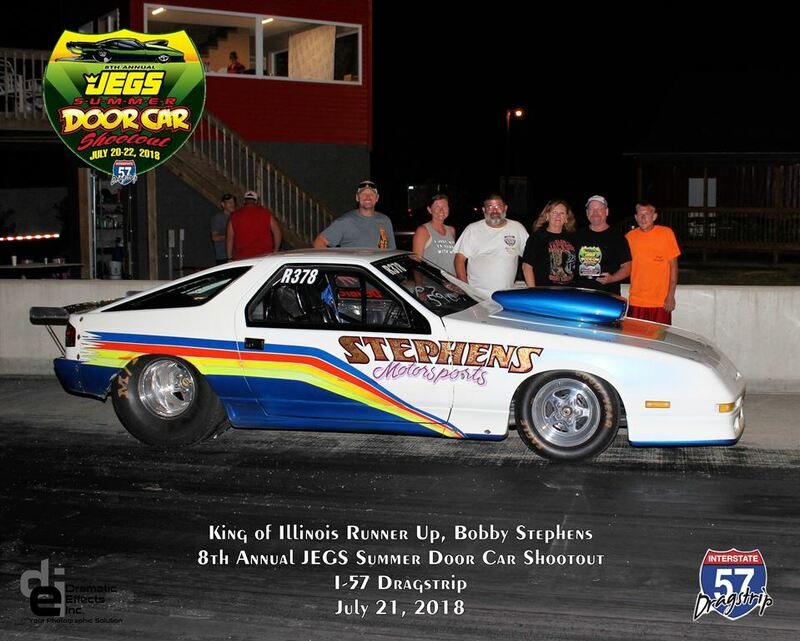 Jones bested Indiana-based Bobby Stephens for the huge APD King of Illinois payday. For a second consecutive season, well-known Kentucky Footbrake racer Lucas Walker went home with the JEGS Wheelie Wagon award. After qualifying his Mustang for the Wheelie Wagon finale on the strength of several impressive wheelstands throughout eliminations, Walker squared off with Travis Eaton in the Saturday night runoff. Though both drivers excited the huge crowd with awesome wheelies, in the end, the prize went back to Kentucky with Walker once again. The highlight of the night may have been the always popular Mickey Thompson Burnout Contest. The contest begins in round 2 of the BRODIX Main Event, in which no less than half a dozen racers performed huge, obnoxious burnouts during competition for the $7500 main event prize. From that qualifier, Jason McKague and Rickey Boggs were selected to runoff in the finale under the lights. Both competitors put on a huge show, and the win was difficult to call. The volume of the fan cheers from the spectator side of the track gave the win (and a fresh set of M/T slicks as well as 15 gallons of VP Racing Fuel) to Boggs. I-57 officials treated racers and weekend spectators to a delicious Racer’s Appreciation Barbecue Saturday night, courtesy of Vintage Trailer Sales. In addition, the folks at BTE made sure that no one went hungry: BTE presented the courtesy breakfast (donuts, muffins, coffee and juice) to racers throughout the event, as well as the BTE Butch Daugherty Memorial Ice Cream Social (complimentary ice cream throughout the race). Sunday action commenced with a familiar name in the winner’s circle. Friday night’s runner-up Dave Angelly one-upped that performance with the Sunday Moser Main Event win. Angelly held the $7500 check in the winner’s circle after another Illinois-based racer, Brett Williamson turned on the red light in the final round. Williamson’s run was impressive: he wheeled his familiar ’57 Chevrolet through the field off the bottom bulb, while racing against delay box equipped cars in each of the 9 rounds of the event! In addition to the big winners, few racers left the JEGS Summer Door Car Shootout empty-handed. Over $30,000 in prizes were awarded to competitors throughout the weekend thanks to support from event sponsors including: JEGS, Ohio Crankshaft, BRODIX, Moser Engineering, BTE, Vintage Trailers, Nitrous Express, APD, VP Racing Fuels, Mickey Thompson Tires, Auto Meter, Flo-Fast, K&R Performance Engineering, California Car Cover, Racepak, AirTek, Digital Delay, the Labor Day No Box Classic, the Southern Footbrake Challenge, the Ohio Crankshaft No Box Nationals, the Footbrake 150, Hoosier Racing Tire, Wiseco, FTI, Racing RV’s, ThisIsBracketRacing ELITE, Tuffpaw, Weld Racing, Todd’s Extreme Paint, Huntsville Engine, Dedenbear, Dixie Racing Products, Fastronix, Renegade Racing Fuel, Abruzzi Transmissions, Manley Performance, Dramatic Effects Photography, Drag Race Solutions, Jesel, Folk Race Cars, J&J Performance, Accelerated Graphics, Mark Sullens E85 Carburetors, DragRaceSolutions.com, Racer Tees, and more. 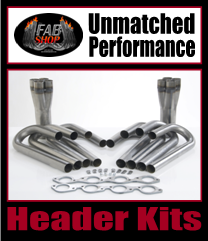 For more information and to keep up to date on next year’s JEGS Summer Door Car Shotoout, visitwww.i57sdcs.com.